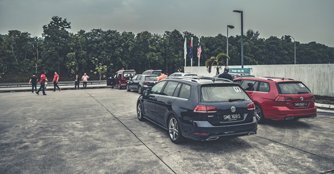 We took the Volkswagen Golf, Golf Variant and Golf SV over a thousand kilometres up to Terengganu, Malacca and back. Last week, we set off from Singapore to Terengganu, an eastern sultanate and constitutive state of federal Malaysia that's a little less visited. But for us, being lesser visited is a good thing because it means we get to take quick, quiet break from work and crowds. We headed up in a fleet of Volkswagen Golfs comprised of the regular Golf hatchback, and the newly launched Golf Variant family estate and the Golf SV compact MPV. 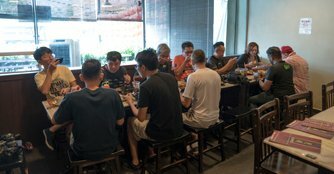 The first car we were assigned to was the Golf SV, which we drove through Tuas Second Link to Gelang Patah R&R for regrouping, and onward for an hour or so to Yuan Yean Fishball Eating House in Yong Peng. At first, we were a little unsure as to how the Golf SV would handle the sprints on the North South Highway given its pudgier proportions compared to the Golf hatchback and the sleek Golf Variant. But the compact MPV was quick to prove its competence as it sat comfortably at high speeds, with nary a complaint as we punched hard through the Malaysian traffic. In the blink of an eye, we reached Yong Peng feeling no less tired than when we set off. The Golf SV has proven itself not only as a capable cross-border hauler, but also one that delivers on all fronts. And even after almost two hours of total driving since we left the showroom, the fuel gauge needle still remained well above the three-quarter mark. It's no wonder the pairing of Volkswagen's TSI engines and DSG transmissions have been praised for their economy. Sadly, we wish we could report that the fishball noodles we had for breakfast at Yong Peng were as good as the Golfs that took us there. 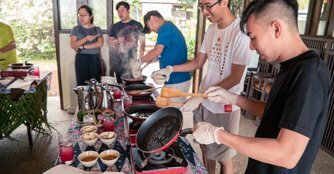 If you're planning a breakfast run up to Yong Peng, you should probably look elsewhere. 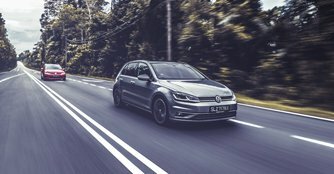 The next car we hopped into was the Golf hatchback, which would take us about 311km, about four hours of driving depending on traffic, from Yong Peng to Tong Juan Restaurant in Cukai, on the outskirts of Terengganu. We covered mostly tight, and occasionally twisty backroads, which were a ton of fun to be on, and they were right up the Golf hatchback's alley. But as the Malaysian backroads are mostly one-laned, there were times when overtaking huge trucks was necessary and that meant involving a lot of concentration and carefully executed manoeuvres. Thankfully, the Golf hatchback's capable turbocharged powertrain, easy-to-drive characteristics and planted ride made things pretty easy, and the convoy was never broken up for too long. Accompanied by 'Sako Isoyan feat. Irina Makosh - Dreamer' playing on the car's Apple CarPlay-equipped infotainment system, we arrived at Tong Juan at about 1:45pm for lunch. It was a nice stop considering that breakfast wasn't too impressive. If you're ever there, try their stuffed crab. It is one of the better crab dishes I've ever had. The fried chicken, marinated prawns and grilled fish are worth a taste, too. 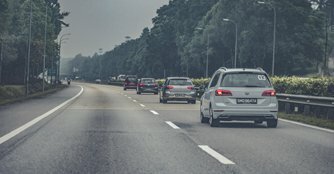 On our final leg up to the beautiful Tanjong Jara Resort in Terengganu, we found one of the nicest highways in the world, namely the East Coast Expressway (E8) - an extension of Kuala Lumpur-Karak Expressway. Compared to the North South Highway, the E8 is pretty much a ghost town, or route in this case. The view, which featured misty highlands, was a treat, too. 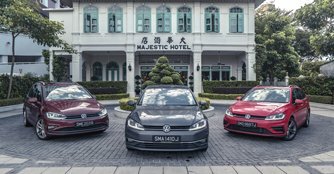 Needless to say, the Golf hatchback, as did its SV sibling, did a stellar job of sitting well at both high speeds, as well as the less well-paved roads of Jalan Bukit Besi. Moreover, it did all that in the rain as we neared our final destination. The Tanjong Jara Resort sits on a crescent-shaped beach in sleepy Dungun. It's reminiscent of some of the resorts in Uluwatu, Bali, where there is little else surrounding the resort but palm trees, jungle and the odd fishing hut. After a long day of driving, it was a welcoming home for the night, accompanied by a private dining experience and beers by the beach. The next morning, Volkswagen Singapore had something quite interesting in stored for us before our drive down to Malacca, where we'd stay for our last night. We would be cooking our own lunch (or so we thought), in a class taught by the head chef of the resort. Not counting instant noodles and eggs, it was my first time cooking, ever. Needless to say, I fumbled with how to properly use a spatula, as well as how much oil and how much heat to employ. Thankfully, under the watchful eyes of the chef, I managed to create a rendang dish that could possibly rival the standards of Sinar Pagi Nasi Padang. The last leg of our trip saw us heading back down to Malacca, where we stayed the night at the Majestic Hotel. It's a modern-classic hotel steeped in a rich tapestry of multicultural influences reflected in its heritage architecture, diverse lifestyles and eclectic cuisine. The heart of the hotel is a restored 1920s Straits Settlement mansion complete with its original porcelain tile flooring and teakwood fittings. It has been sympathetically extended to house the guest rooms and suites as well as an award-winning spa that is a reflection of that era, melding luxury, modernity and tradition. Our route to Malacca was pretty similar to the one we took up to Terengganu, consisting of half highways and half backroads. This time around, however, we faced merciless rains that heavily blurred our vision. Still, there was little to worry about given the fact that we were driving some of Wolfsburg's finest, equipped with safety features such as high-strength steels, electronic stabilisation programmes, blind spot monitors and proactive occupant protection systems, just to name a few. Nearer to Malacca, the rain got so bad we could barely see the car in front of us. So we took the chance to slow things down and just enjoy the well-judged ride and creature comforts our Golf Variant had to offer. Before we knew it, we entered the peak-hour traffic of central Malacca. Dinner that night was had at Bei Zhan, a tse char-style restaurant famous amongst locals and tourists alike that won 'The Best Chinese Restaurant' in the state from 2006 to 2009. But as fulfilling as dinner was, what would a night in Malacca be if it were not topped off with a nightcap (or two, or three) at Hard Rock Cafe? That would be like driving a Volkswagen without the TSI engine, DSG transmission, the brand's well-tweaked chassis and suspension systems as well as highly intuitive and informative infotainment systems. Like the activities and the cars and people that we have experienced on this trip, it is when all these things come together that you are left with something special, and rather unforgettable.